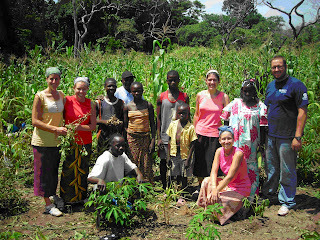 Grace Brethren International Missions’ (GBIM) first Mission Exploration Team (MET) had a unique experience in Africa during June and July 2008. The new program is designed to give participants an in-depth internship in missions in a dynamic team environment. The first destination was the Central African Republic (CAR) and four more opportunities around the world are planned for 2009. In the CAR, five team members and two leaders prayed together, studied cross-cultural dynamics and mission strategies, and immediately applied what they were learning through ministry. Each of the five members lived with an African family, ministered with African leaders and helped an African community. The MET participants were challenged and experienced God’s faithfulness. In the summer of 2009, GBIM is offering four more opportunities to explore missions. During five to six week long trips to Asia, Africa, Europe, or Latin America, participants will receive in-depth training, build cross-cultural skills, and gain hands-on ministry experience alongside GBIM missionaries. For more information about joining a Mission Exploration Team visit www.gbim.org or e-mail John Ward at GBIM.